What happens when scientists need supplies, but are hundreds of miles from civilization and surrounded by an 8 foot thick sheet of ice? Billion dollar, specially designed icebreaker ships act as mobile science platforms and make way for supply, personnel, and refueling ships. Due to destructive forces and rough terrain, these ships are often in short supply. Let's take a look at these massive ships — and what happens when hundreds of scientists are stranded and in need of supplies in Antarctica. 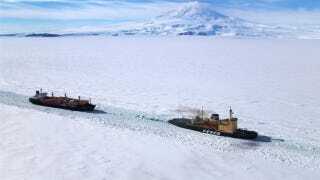 The top image, courtesy of the NSF, shows an icebreaker ship paving the way for a resupply mission at McMurdo Station. Icebreaker ships are necessary to move and supply scientists studying the extreme climate and fascinating extremophile organisms living Antarctica and other ice-covered parts of the world. Built in 1955 on a sea of volcanic rock, McMurdo Station is the largest Antarctic base and the U.S. hub for its NSF funded Antarctic Program, with over 900 scientists living and working at McMurdo. Antarctica is also home to Palmer Station , a smaller outpost holding 40 scientists. Both stations are surrounded by miles of six to eight feet thick ice. McMurdo Station is a common plot point in sci-fi and pop culture quite often due to its extreme location. Sheldon from The Big Bang Theory likely spent the summer between seasons two and three at McMurdo while Leonard and the gang falsified data. Stargate SG-1 used McMurdo as one of humanity's last military bases and John Carpenter's The Thing makes reference to the station. Greg Rucka's Whiteout, a comic turned movie, is told from the perspective of a U.S. Marshal working at McMurdo Station. How does an Icebreaker work? The ships come in a variety of sizes, with only a handful of the ships able to navigate the ice covered waters of Earth's poles. Icebreaker ships rely on a reinforced hull, a specially designed bow, and an enormous power supply to create a path for ships carrying people and supply to some of the most inhabitable and environmentally hostile regions on the planet. The ice is broken not by the forward driving force of the ship, but by using the specially designed front of the ship to move on top of the ice - the weight of the ship then breaks the ice. Shaping the front of the ship (the "bow") like a spoon allows the ship to slide up and onto the ice. The United States' National Science Foundation also outfits two icebreakers, the Nathaniel B. Palmer and the Laurence M. Gould. The ships act as mobile research stations for climate and polar research. The Polar Star & Polar Sea are operated by the U.S. Coast Guard, with the NSF funding repairs and fuel for duo in recent years. Russia is home to several functioning icebreakers, including the only nuclear-powered icebreakers in the world. The icebreakers used within Russia are necessary to keep commercial shipping channels in northern parts of the country open for trade. How much do Icebreaker ships cost? Due to the rigors of the work these ships perform, routine damage piles up. Temporary decommissioning for repairs can take 2 years and cost $200 to 400 million for a refit that lasts only 7-10 years. Building a new heavy icebreaker costs upwards of one billion dollars. Individual icebreakers are decommissioned several times during their lifespan for large scale repairs, with well-maintained ships in service for 25-30 years. Cutting off supplies to NSF research stations? A typical refueling mission to McMurdo station calls for an icebreaker to pass through 12-14 nautical miles of ice — sheets of ice 6 to 8 feet thick. Without a high-powered icebreaker ship, re-supplying the sites is impossible. The Polar Star is currently out of service for repairs until 2014, the Polar Sea is unlikely to ever sail again, while the Laurence M. Gould shuttles supplies to the Antarctic on another path from the coast to Chile to Antarctica. What happens when you can't get supplies to McMurdo Station? This scenario played out in the Fall of 2011. With no other option, the National Science Foundation asked Sweden use their icebreaker, Oden, to resupply McMurdo Station and camps throughout the Antarctic. The Swedish government refused the request, leading the NSF to consider a contingency plan pulling researchers out of Antarctica and temporarily ending polar research. To end the stalemate, the NSF chartered a Russian icebreaker, the Vladimir Ignatyuk, to supply McMurdo and other Antarctic stations. Losing the Space Race & the Snow Race? Do we want to continue researching one of the most bizarre environments on earth? Imagine the medicinal and biochemical opportunities that lie amongst the thermophilic organisms living within the world's most extreme terrain. The United States' crewed space efforts are non-existent at the moment — does the country want to lose the foothold established by two previous generations in Antarctica? Is humanity's search for unknown knowledge and adventure on Earth over? Images courtesy of the NSF, the U.S. Coast Guard, and Raytheon. Sources linked within the article.